Everyone else got a choice of steak or pasta. I thought great, maybe I will get steak (as that can easily be done gluten free) and joked that I hoped it wasn’t fish again. The meal came and I had a measly salad and dry FISH as a main course and some fruit as dessert. This left me frustrated as I am not a fan of fish and it seems to be the default for gluten free meals on BA, despite the fact many people do not enjoy fish and there are other options on the menu everyone else is getting (like steak or chicken), which could easily be adapted so that those GF could have them. In fact I suspect it wouldn’t be hard to make at least one of the two menu options always gluten free, making it much easier to deal with gluten allergies. As a result I did not eat my meal and was left thoroughly disappointed. On the way back and for the first time in as long as I can remember it was not fish. Happy days I thought, until I looked more closely. This time I had some rice cakes instead of a bread roll (weird given how easy it is to get great gluten free bread products in the UK and US now), a shriveled up dry piece of chicken, some dry rice (hard and stuck together), some over-cooked veg and no sauce!! And some orange segments for dessert. 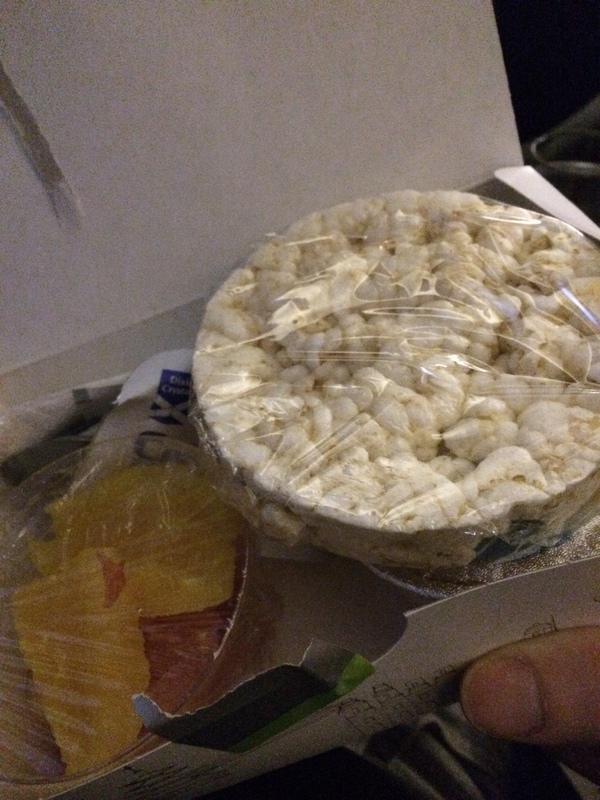 Again whilst other passengers had steak and appetising desserts, along with rolls from the bread basket. Now as I say I love BA and have been reassured many a time that dietary requirements are taken seriously and always being improved, but over the last couple of years, despite massive advances in gluten free awareness and products available, I have seen no improvement in the gluten free provision on British Airways flights, seeing little difference from economy through to business class. So this is a plea, BA if you value your customers (an increasing amount of whom will have issues with gluten) and stand by your promise ‘To Fly, To Serve’, please please make meal times on your flights as enjoyable as the customer service, environment and the best gin and tonic in the sky.